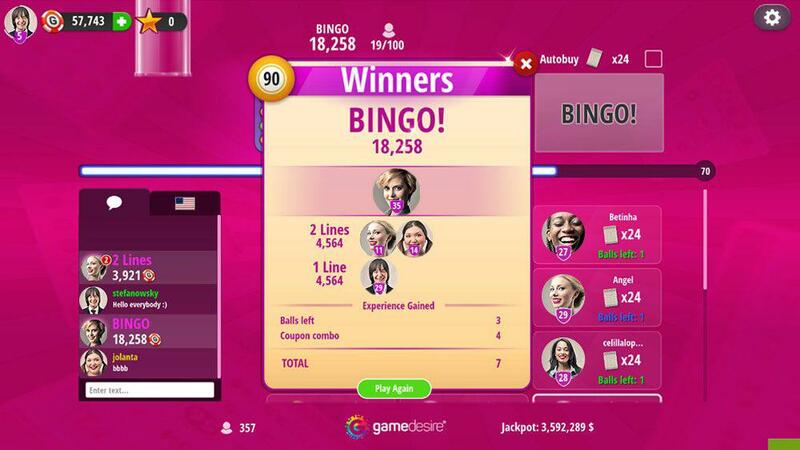 Bingo is primarily about simple rules and fast gameplay. Virtually everyone can play - you only need good reflexes and observation. You are guaranteed to experience emotions just like those in the real-life gambling game. At GameDesire you can play two variants of this game: bingo 75 and bingo 90. If you are looking for entertainment, you can play for low stakes. For adrenaline seekers, tables offering higher winnings are recommended. Anyone who has ever tried their hand at this game, which enjoys great popularity around the world, will readily admit that bingo is a pull. It does not require special skills such as, for example, card games including thousand, rummy or poker. You need just a little bit of luck, a watchful eye and quick reflexes in order to beat your opponents and win big! If you haven’t had the chance to play bingo, you absolutely need to try it for yourself and find out why the world went crazy about this simple game. You don’t have to leave home, invite your friends around, or deal special playing cards in order to play an exciting game of bingo. You are just a few mouse clicks away from a table full of bingo players. 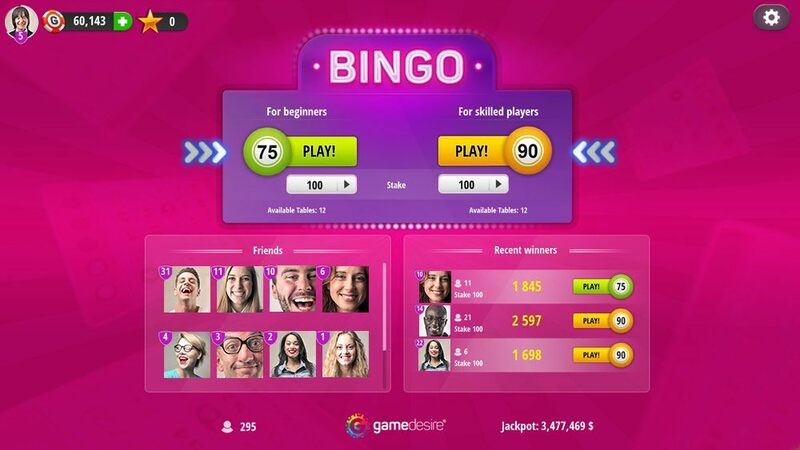 When playing bingo online, you can also make interesting new friends, with whom the game will be even more competitive and addictive. When it came into existence, in the 1920s, the game of bingo had a completely different name. According to the old story, bingo was first called beano, which is a corruption of the English word "bean". At the beginning, that vegetable covered called numbers on a paper or stone board. An excited player, announcing their victory their opponents, probably mistakenly yelled "bingo" (instead of "beano"). Everyone liked this so much that the name was changed, and has survived to this day. Another legend, much more probably, suggests that the name bingo was coined by Edwin Lowe, who was selling toys in New York. The game quickly gained popularity, especially after Lowe and his colleague Carl Leffler increased increase the number of combinations on the boards. The biggest games in the 1930s were held in a church in Pennsylvania, where the priest had a true passion for bingo and saw the golden potential of this game. European online bingo is slightly different from that played in the United States or Canada. But the changes are not so great. In Poland, at the shout of "bingo!" the game is over. In contrast, our neighbors from the other continent continue to play the game until the entire board is full. Today, a computer draws the numbers, which are no longer engraved on special disks and removed from cigar boxes. The rules of bingo online are fairly simple. They can be described in one sentence. During the game, each participant has randomly chosen numbers on a 5x5 (bingo 75) or 3x9 (bingo 90) board, and whoever completes the set of numbers first wins. Each bingo coupon has a different set of numbers. Therefore, buying several coupons during a round increases your chances of winning. 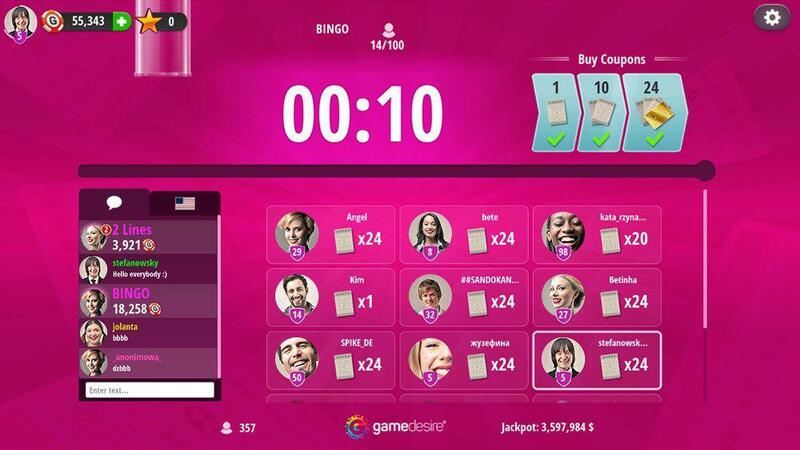 Both online versions of bingo are available for beginners and advanced players. Everything depends on a player’s skills and proficiency. Start by selecting the game variant, that is, the size of the board. You can choose from bingo 75 and bingo 90. Determine your stake of 100, 1 000 or 5 000 virtual chips, without risking real money, and click the “play” button. 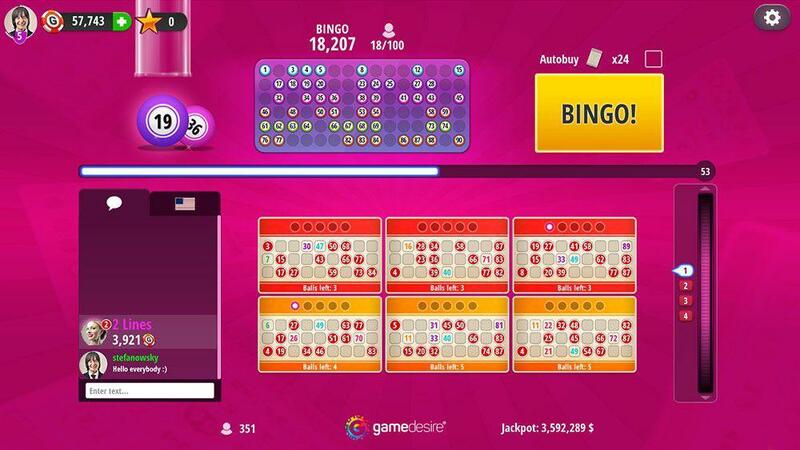 If you are a novice player, bingo 75 is the perfect choice for you. In the more advanced bingo 90 version, as well as calling "bingo" to win, you can try to complete "one line", "two lines" or a "full house", the latter involving filling the whole card, for which you get extra bonuses. Up to 100 people can take part in each game. Immerse yourself swiftly into the game that is continuing to gain fans around the world. It is worth checking the game out for yourself, and sharing the thrill and adrenaline experienced by millions of players when marking each number on your board. Will you be able to shout "bingo!" during your first game? Find out, by signing up at www.gamedesire.com.